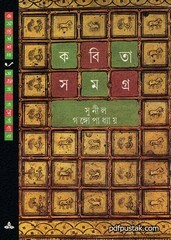 It is a published poetry book- Kabita Samagra by Sunil Gangopadhyay, part-1. It has been compiled by his six poetry books, 'Eka ebong Kayekjon', 'Ami Kirakam Bhabe Beche Achhi', 'Bandi, Jege Achho', 'Amar Swapno', 'Satyabaddha Abhiman' and 'Jagaron Hembarna'. Everybady know that Sunil Gangopadhyay is a powerful creator of modern Bengali poetry. Readers can collect the ebook pdf file of this great collection. The pdf has 1468 HQ pages, 45mb file size.